Apple’s computers have never exactly been known for their graphics prowess, but the last year or two the company has taken the opportunity to improve its standing with official support for external GPUs connected via Thunderbolt 3. 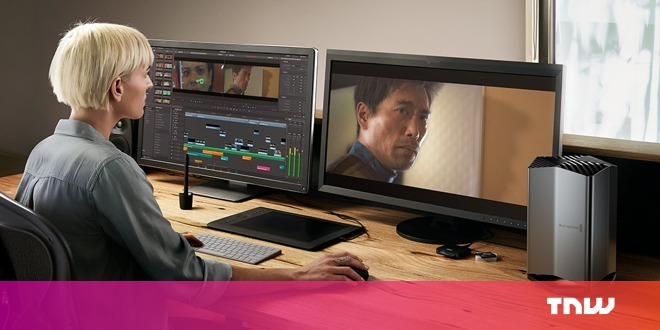 Fresh from releasing newly updated MacBooks, the company has collaborated with film hardware company Blackmagic on a $699 eGPU. Before you scoff at the price, there’s one difference compared to other eGPU solutions: this one actually includes the graphics card. Specifically, the Blackmagic eGPU comes with a Radeon Pro 580 sporting 8GB of memory, which is roughly equivalent to an Nvidia 1060. In all, Apple says the 580 should provide a 2.8x graphics improvement to the 15-inch MacBook Pro, and as much as an 8x improvement on the 13-inch models. It’s a far from the most powerful GPU out there, but it should provide a notable imrovement for most GPU-intensive applications. For some perspective, a traditional Radeon RX 580 should offer similar performance and normally goes for around $300. In other words, you’re still paying a significant premium for the rest of the chassis – especially considering the graphics card isn’t upgradeable – but there are a few interesting features that might make it worth your while. For one, it’s apparently the first eGPU to support Thunderbolt 3 displays like LG’s Apple-approved 5K Monitor. It also is a veritable docking station, with comes with four USB 3.0 ports, two Thunderbolt 3 ports, and a single HDMI port. That last tidbit could be annoying if you want to connect more than one monitor though, as you’ll either have to use an adapter or buy one of the few monitors that connect via USB-C. Unless you really need that 5K display, I still think it’s probably a better idea to buy another external GPU enclosure that you could upgrade freely; they cost around $300. But aside from the plug-and-play simplicity of Apple and Blackmagic’s solution, perhaps the most compelling reason for you to buy this all-in-one unit is that it’s said to be whisper-quiet. In any case, it’s good to have options. If you’re worried about your MacBook not having enough graphics juice but would rather not shell out for a desktop, the Blackmagic eGPU is worth a look. It’ll go on sale starting July 13 at select Apple stores and Apple.com.